Never having eaten or made beef fried rice before, I was not too sure how this would end up tasting. I was in a mood to just throw some food together and see what happened. I was pleasantly surprised at the end result. I had cooked a roast of beef the previous night and had enough left over for this recipe. This was a very quick and easy meal to prepare. While your rice is cooking prepare your beef and vegetables. Cut the beef into bite size pieces. Chop onion to the size you prefer. Heat vegetable oil in a wok, electric frying pan, or large frying pan. Once the oil is heated add celery, onions and stir fry for three minutes. Add the frozen vegetables, stir and continue cooking for approximately five minutes. Add garlic slices, beef and cooked rice. Stir and add 1/4 cup of Soy Sauce. Cook until everything is heated to your liking. This rice can be used as a main dish meal or you may want to add it to other dishes as a side dish. Hi There, Glad you found my blog. I love yours also... 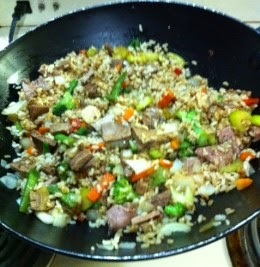 I have never tried to make Beef (or Shrimp) Fried Rice---but now that I have this recipe, I may try it... I have always loved it. We use our wok quite often and have had similar meals --but not this one. Thanks for the recipe.